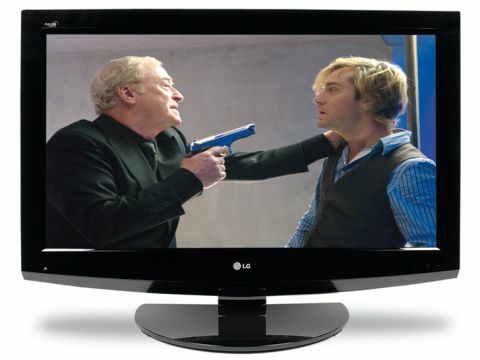 LG's 37LF75 oozes instant appeal on not one but two fronts. First of all there's its extravagant design, which boasts a cutely arced bottom edge and very tasteful barrel-shaped stand connection. Not surprisingly this is one of LG's new Design Art range of TVs. Its other big selling point is the fact that, despite being a 37in screen costing just £650, it sports a 1,920 x1,080 pixel-count. Nice. An impressive trio of HDMI connections can all take 1080p/24 feeds of the sort provided by most HD disc players. You also get a digital audio output and component video input. So far there's nothing about the 37LF75 to suggest exactly why it's so affordable. And this continues into its superbly presented onscreen menus, which contain such niceties as black level adjustment; a Surround MAX pseudo surround sound mode; a Just Scan mode for showing HD sources pixel for pixel; and last but not least, LG's XD Engine processing for improving colours, black levels, general sharpness, and noise reduction. At times the 37LF75's picture quality is outstanding. You may find your jaw hanging open with awe at the sensational amounts of clarity and detail on show in an HD scene, especially if you apply the set's Just Scan mode. There's practically no video noise either, unless it exists in the source, and there's little trouble with LCD's usual motion smearing. The 37LF75's pictures are also remarkably bright and vibrant and their colours enjoy a level of tonal naturalism that's rare indeed at this price level, despite also being unusually rich and fully saturated. The only problem we have with the set is its rather average black level response. Dark scenes, such as those in Armageddon, suffer slightly more greying over of their blackest bits than we'd really like to see. Standard-definition pictures can look a bit noisy too, although you can reduce this if you tone down the colours and contrast settings. The TV's sound, meanwhile, is okay, but nothing more. Trebles are reasonably clean and voices are generally audible even during one of Armageddon's many ultra noisy sequences. As per many a flat TV, however, there's just not enough bass on offer to do full justice to a good film soundtrack. Despite its flaws, though, we really like the 37LF75. Even at its worst it's better than average for the money, and at its best delivering HD programming, we'd regard it as quite outstanding.